The Sled Dog volunteers come from all corners of the world to share their skills, expertise and genuine passion for alpine ski racing during the Lake Louise Audi FIS Ski World Cup. Where did it all start? In 1988, a group of enthusiastic volunteers assembled to work as the ladies’ technical course crew for the Olympic Winter Games in Calgary. High winds and higher temperatures created huge challenges for the Race Organizing Committee. Consequently, crews worked around the clock to get the races off and he Course Crew determined that they were being worked like “dogs”. The analogy morphed into a Siberian husky; a breed known for its loyalty, intelligence, speed, endurance and its preference for the outdoors – also its ability to work hard and haul a lot of stuff. The Sled Dogs were born and quickly defined themselves by their work ethic and their ability to enjoy the festivities and when necessary, create them. The essence of a Sled Dog is captured in our beloved logo. With a sparkle in their eye, they have a little bit of attitude, confidence and that “relish in the face of adversity”. They carry a belt, drill and shovel, while on skis they balance a frosty beverage for the end of the day. 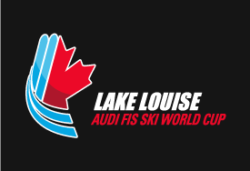 Today the Sled Dogs are recognized throughout alpine ski racing circles as the volunteer corps of the Lake Louise Audi FIS Ski World Cup who come together to ensure the men’s and ladies’ events go off without a hitch. Being a Sled Dog is no ordinary volunteer job – work hard, play hard is the credo. The friendships, the laughs and the experience make it all worth-while.